by Sergey Yurish, Interview for The Mag, January-March 2010, pp.4-5. 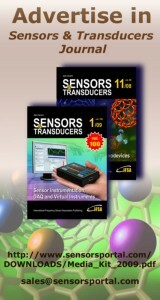 Sensors & Transducers journal, Vol.8 Special Issue on Intelligent Data Acquisition and Smart Sensors Systems, February 2010. GIA announces the release of a comprehensive global report on Chemical Sensors markets. The world market for chemical sensors is projected to reach $17.28 billion by the year 2015. New product innovations and expanding applications will offer considerable growth opportunities in spite of relatively slower gains in mature markets such as pH testing, industrial safety, and flue gas emissions monitoring. San Jose, CA (PRWEB) February 17, 2010 - Chemical sensors are used to improve point-of-care diagnostics in medical applications, control and monitor environmental pollution, provide compact, fast, low power, and sensitive tools for quality and process control in industrial applications, as well as improve or implement warfare threat detection and security. Advances in the medical/diagnostic test market and escalating use of chemical sensors in large-scale industrial and environmental applications will drive the market for chemical sensors, including biosensors and gas sensors. Poor water quality and the urgent need to conserve water resource will stir up demand for dissolved-gases sensors. Demand for chemical sensors will be fuelled by newer applications for established sensor products; product innovation through the use of microfabrication and other high tech manufacturing techniques; and falling cost of high-performance sensor types. Biosensors and optical sensors are a hot spot for generating revenue, which is especially true for mass volume applications in the industrial, consumer and motor vehicle sectors. The decline in end-use markets such as automotive and biometrics will to a large extent be counterbalanced by the indispensable use of chemical sensors in medical diagnostics. Biosensors market stands immensely benefited by the rapidly aging populating, increased spending in the healthcare sector, increasing demand for point-of-care testing & monitoring solutions, shift towards alternate sites of healthcare, and increased occurrences of a number of chronic diseases. The demand for dissolved-gases sensors is expected to witness steady growth due to rising environmental concerns such as water quality as well as growth witnessed in aquaculture industry. Global market for gas sensors is driven by demand from OEM and replacement market needs. There is an increasing demand for carbon dioxide (CO2) sensors in bulk food storage sector, due to the proven ability of CO2 sensors in detecting incipient spoilage as well as assessing CO2 levels in storage structures and controlled atmosphere packages.